Walter McConnell received his BFA from the University of Connecticut in 1974, and his MFA in Ceramic Art from Alfred University in 1986. 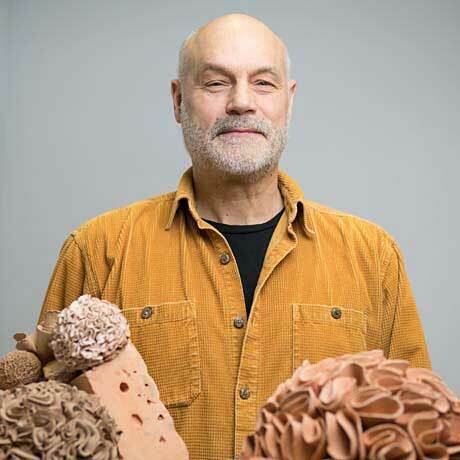 Well known for his installations of moist clay and towering assemblages of cast porcelain, he is the recipient of grants from, The Joan Mitchell Foundation, The Louis Comfort Tiffany Foundation, the New York Foundation for the Arts and the Constance Saltonstall Foundation. McConnell has exhibited at the Denver Art Museum, the Philadelphia Museum of Art, MASS MoCA, the Daum Museum, the CU Art Museum, Boulder, Colorado and at SOFA, New York. He has exhibited internationally in Sweden, the Netherlands, Taiwan, China and Korea. Represented by Cross-Mackenzie Gallery in Washington DC, essays and reviews on McConnell’s work have appeared in World Sculpture News, The New Art Examiner, Ceramics: Art and Perception, The New York Times, The Washington Post and Ceramics Monthly. McConnell’s academic appointments include: The School of the Art Institute of Chicago and The University of Connecticut. McConnell is currently Professor of Ceramic Art at the New York State College of Ceramics at Alfred University.